Toddler - €38.99 Only 3 left! Argh! Ahoy Matey! Everybody knows that a pirate’s life is one of adventure. It is filled with treasure hunting, evading imperial forces, and plenty of action-packed battles upon the sea that one can normally only hope to see in a summer blockbuster. The life of a pirate is not for everyone, only for the bravest buckaroos in all the land. Think your kiddo is ready to join the ranks of the most infamous seadogs to have ever sailed the ocean blue? Excellent! We’ve got the perfect costume for him to start his pirating career. 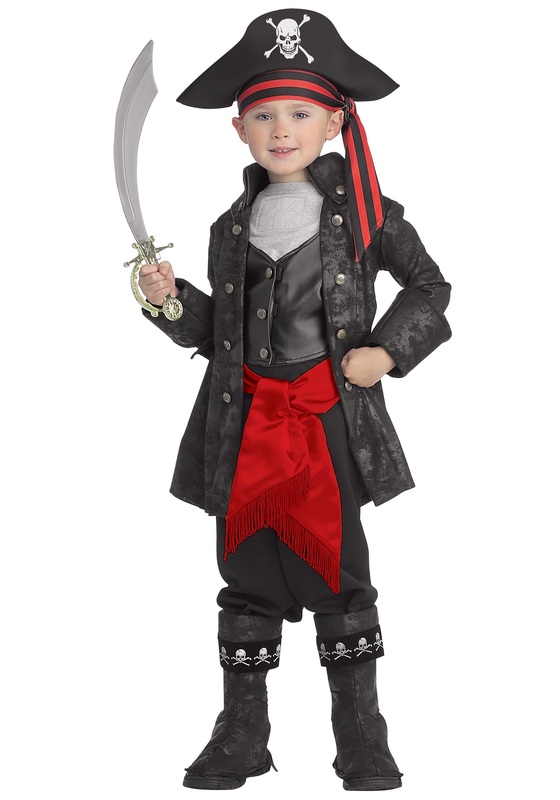 Take a look at this Captain Black Pirate Costume for children. Once your little swashbuckler tosses on this captain’s outfit, he’ll transform into the fiercest pirate in the seven seas. Nothing says large and in charge like this black and red outfit. Your kiddo will truly look like a force to be reckoned. In no time, he’ll have lines of loyal men and women that want to join his crew and make it big as a nefarious gang of rapscallions. Once you arm him with a shiny blade, he’ll be ready to lead his crew onward into a grand adventure. Who knows, maybe they’ll come across a mysterious treasure map that leads to a hidden fortune! Wow, that would certainly be helpful when it comes time to pay for college. Help your kiddo find some adventure this Halloween with this Kid’s Captain Black Pirate Costume. If luck is the wind beneath his sails, then he’ll be sure to have a very profitable career in piracy!